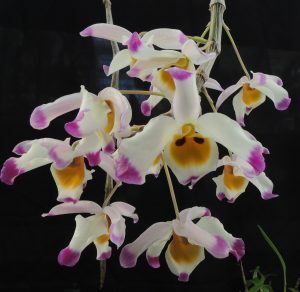 Dendrobium wardianum is a pendulous plant with long psuedobulbs up to 80cm long. It comes from the Eastern Himalayas from Assam through to Vietnam where it is found from 1000 to 2000m and so experiences a monsoon climate with a warm wet summer and a cooler dryer winter. It is deciduous and needs a cooler dryer winter rest to lose its leaves from the previous year’s growth and then flower in April from the bare pseudobulb. The flowers have that delightful dipped in pink ink tip to the petals and sepals as well as a lot of yellow in the lip which distinguishes it from the similar looking Dendrobium nobile. Dendrobium nobile also flowers of pseudobulbs produced two years ago not the most recent ones like this species. Dendrobium nobile and Dendrobium wardianum form the basis of a large group of hybrids. We grow this species in Warm Asia for the summer months (April – November) but give its dry winter rest hanging high in cooler temperatures in Cool Americas. 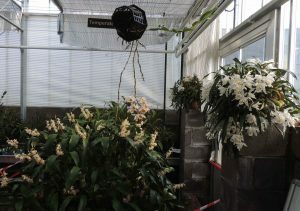 At present it is in our temperate section so that it remains fresh for Paris along with Coelogyne cristata and Coelogyne holochila. Worth the wait! I must say how beautiful the greenhouse looks with all the plants you are taking to Paris. You should be really proud of such a fine display.